Veterans • American Indian practitioner helps others after his own suicide attempt. Scott Sommerdorf | The Salt Lake Tribune Arnold Thomas who works with the Veterans Affairs Medical Center as a Native American Traditional Practitioner, Monday July 30, 2012.Scott Sommerdorf | The Salt Lake Tribune Arnold Thomas works with the Veterans Affairs Medical Center as a Native American Traditional Practitioner, Monday July 30, 2012. 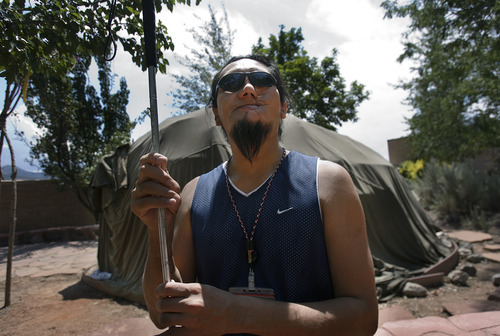 He poses outside a sweat lodge at the center. To find out about suicide prevention, visit http://www.suicidepreventionlifeline.org or call the National Suicide Prevention Lifeline toll-free number 1-800-273-TALK. To learn about the American Foundation for Suicide Prevention Utah Chapter, visit http://afsputahchapter.com. According to the American Foundation for Suicide Prevention, 90 percent of people who die by suicide have a diagnosable and treatable psychiatric disorder.